I’ve decided I want to get the word “Be” tattooed on my wrist as a reminder. For me, it would be a reminder of a lot of different things. Relax. Be in the moment. Let the children be. Let the activity be. Watch. Observe. It’s becoming increasingly stressful to be an early childhood educator. The demand to get children ready for school is an ever-present thought in every educator’s brain. My reaction to these demands is to BE. Be with the children. Grasp those teachable moments. Be in the process. Give children finger paint and let them explore. Be outside. Participate in the wonder of nature. Be amazed at the children’s curiosity. Read books. Be in the story. Be quiet. Listen to the environment. Listen to the children. You may be surprised at how much children learn during these moments. You may also be surprised at how much YOU learn, as well. 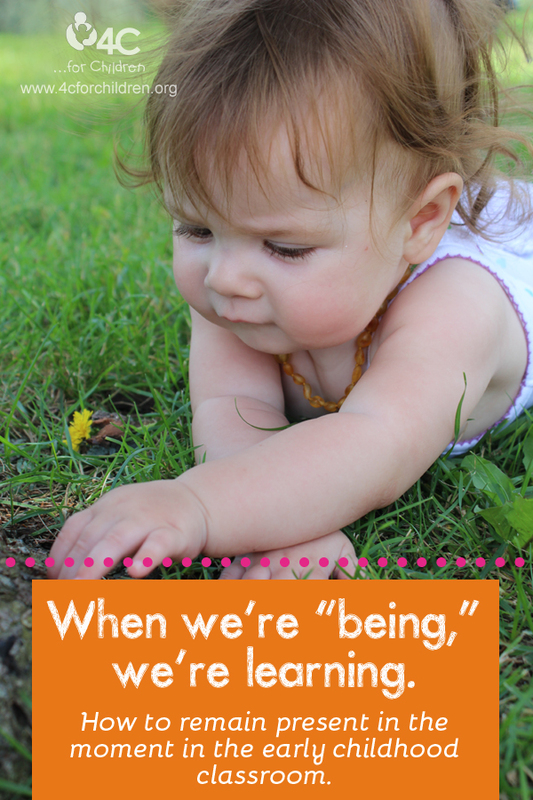 As we are being, we are teaching and children are learning. Children are learning the scientific process while interacting with paint. They are learning about textures while exploring nature. Children are learning writing skills while using crayons and markers. They are learning math skills while working with blocks. Children are learning self-regulation while engaged in dramatic play. Most of all, children are learning to BE. They are learning to be competent learners. They are learning that school is fun. They are developing a passion for learning. Children are learning to trust their adults. They are learning to trust themselves. My advice to early childhood educators? Bask in the attention that’s currently being paid to our field. Showcase your talents. Advocate for your children. Educate society on what the children are learning because you are BEING with them. Have an understanding in theory and developmentally appropriate practice so that your BEING is rooted in a firm foundation. Know why you are doing what you are doing. Soon enough everyone else will realize the value of being, too. This entry was posted in Advocating for Children, Early Childhood and tagged child care, children, early childhood, educators, families, kindergarten readiness, parents, school on July 25, 2013 by Christine Fields. I had the opportunity to live in Seoul, South Korea for about a year. I was able to experience all different kinds of people and food. I had the opportunity to live in a busy, urban area and only use public transportation. Grocery stores were different. Everything I experienced while I was there was different. But I hope you noticed that the word I used to describe my experiences was ‘different,’ not ‘bad.’ Sometimes, things that are different make us feel uncomfortable. Because we are uncomfortable and experiencing something that varies from our version of normal, we place judgment on those differences and label them as bad or wrong. Things that are different aren’t bad or wrong, they’re new. They provide us an opportunity to see things from a new perspective. Each and every day new families enter our child care facilities and see things that are very different from what they have at home. These families are experiencing a new culture: the culture of child care. One that is naturally very different from their home environments. And it’s good that it’s different! For some children and families, the culture of child care can feel very overwhelming. There are so many people. The food might be different. The place they sleep probably feels different. The way people communicate might feel different. It might even smell different. Knowing that child care has a culture all of its own, how do we make families feel welcome? Do you shuffle kids and families through your doors, expecting them to know just what to do? Or do you take time out to say hello and be available to chat with them about some of the new things they are experiencing? When I arrived in South Korea with 2 young children and way too much luggage, I was greeted by a very large gentleman who spoke no English. I’ll be honest. I was scared until he smiled at me, tapped my hand and pointed me in the right direction. His smile showed me that even though I couldn’t communicate with him verbally, that it was going to be okay. It showed me that all these very different things would likely be fun because I was surrounded by people who were friendly and willing to point me in the right direction. I sure hope that you will take time to smile and point a new family in the right direction. This entry was posted in Early Childhood, Family Child Care and tagged child care, children, early childhood, families, parents, teachers on July 17, 2013 by angiegood. Recently when we were sitting at the table finishing lunch, my wife and I were relishing an extended conversation while our son, Eli, switched between spreading peanut butter on crackers and licking his fingers. With lunch I had a glass of water and Eli had an apple juice box. As my wife and I continued talking, I saw something out of the corner of my eye: Eli’s hand reaching for my glass of water. I looked over and he smiled and said, “Can I have this?” “Sure,” I replied. Boy, was he excited. But why? Did he finish his juice box? Was he still thirsty? Turns out he needed to experiment. He spread out a cloth napkin on the table, dunked his juice box upside down into my half-full glass of water, gave it a squeeze, set the box on the table and squeezed again. Much to his delight, watery apple juice squirted out! Over and over he did this until he was out of water. He replied, “Like this,” dunking his juice box in the water glass again and squeezing it. “Oh, you squeeze it and air bubbles come out. Where does the water go?” I asked. “Yah, it goes here,” he said, giving the box a good squeeze, making the water spray onto the napkin. “I like how you spread the napkin out. It seems to catch the water,” I said. Why didn’t my wife and I stop this? Water could go everywhere; he’s playing with a glass and making a mess! But we didn’t stop him. We never stepped in and re-directed him. Why not? What were we thinking? We were thinking , “Why NOT let him experiment?” He was gaining so much from this harmless activity that to stop him would keep him from learning and making connections with other activities. It only lasted about eight minutes and he was thoroughly satisfied when finished. 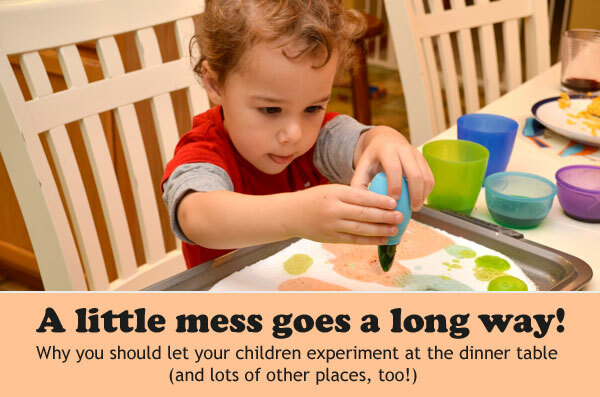 Allowing young children the freedom to experiment with materials in their own way encourages them to be scientists, hypothesize about problems and discover for themselves how and why things work. They also are developing fine motor and persistence skills needed to navigate a complex world. When we take this window of opportunity to ask probing questions, add new vocabulary and allow for time to process we turn this impromptu moment into an intentional one. This entry was posted in Best Practice, Early Childhood, Preschool and tagged children, early childhood, kids, parents, preschool, teachers, toddlers on March 27, 2013 by Josh Craig. That comment really hurt my feelings, because I know that he does so many things right. He is one of the coolest young men that I know. He’s a responsible student that works hard. He’s a great friend to those around him. He is generous with his time and gives what he can back to the community. He asks really thought provoking questions that make people think. He can participate in very high levels of conversation about topics that are relevant to current events and life in general. I just didn’t understand how he could believe that I think he does everything wrong. And then it hit me like a ton of bricks. I couldn’t remember the last time I said something positive to him. Even though I share so many amazing things that he does with so many people in my life, it didn’t even occur to me to compliment him on all of the things I noticed him doing well. 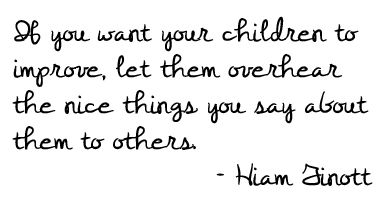 Hiam Ginott, a school teacher and child psychologist, once said, “If you want your children to improve, let them overhear the nice things you say about them to others.” Although I am using this quote to help me in parenting my son, I think this very much applies to the work we do in classrooms every single day. It’s important to let the children we work with know how valued they are and how much they are cared for and respected. There are times that adults struggle with positive things to say about the behaviors that happen every day in our classrooms or even in our homes with our own children. However, we don’t want to get into a situation where all the children hear is a report about the negative behaviors that are seen. Children are miraculous human beings that are capable of so much good. Let’s tell them about all the good things that they are doing and can do going forward. So, the first thing on my agenda when I get home today will be to let my son Sam know how grateful I am to be his mom and compliment him on something he’s done well today. What nice thing will you share with a child to let them know just how wonderful they can be? This entry was posted in Best Practice, Early Childhood and tagged children, early childhood, families, kids, parents, teachers on February 21, 2013 by angiegood. Everyone knows that listening is a big part of communicating with children. But have you ever thought about listening with your eyes as well as your ears? Observing a child’s non-verbal communication is one way to find out what’s really on their mind. Even as adults we sometimes have a hard time putting our true feelings into words. Children find it even harder. By reading a child’s expressions and subtle ways of moving you can get a fuller picture. And once you see what’s on your child’s mind, tuning in and responding becomes much easier. Photo courtesy of Lee LeFever. Listening with your eyes isn’t difficult. In fact, most teachers learn it from the experts: babies. A baby who silently turns down the corners of his mouth has effectively delivered their message. A baby who turns his head away while playing an exciting game of peek-a-boo may be saying, “Whew, this sure is fun, but I need a minute to calm down.” In the same way, a wide-eyed look of wonder or a wrinkled brow tells a teacher whether to keep on playing or call a momentary halt. By listening with your eyes, you can figure out when a baby has had enough, when she wants more, what she’s afraid of, and what she’s fascinated by. All without her saying a word. It works with older children, too. A child in your class tells you he has had a great day at school, but bites his lip and looks out the window as he says it. His expression makes you decide to sit down and talk for awhile. You notice that one of the girls in your class will raise her eyebrows when you tell her it is time to clean up the dramatic play area. Seeing her expression makes you think that maybe she really was not ready to clean up and you have interrupted her work. You give her the benefit of the doubt. You witness two children playing a new board game in your classroom. You notice one child lift his hand to their mouth in hesitation when it’s his turn. You help out with a subtle hint instead of telling him that everyone’s waiting on him and we need to move the game along. Listening with your eyes as well as with your ears can help you figure out and respond to what your children are feeling as well as to what they’re saying. It may mean glancing away from a clean-up routine, picking up the block area, cleaning out the paint jars, supervising the bathroom line or any one of a thousand things a busy teacher has to get done. But what you “hear” with that glance may well be worth a thousand words. This entry was posted in Best Practice, Early Childhood, Infants and Toddlers, Parents, Preschool and tagged child care, children, early childhood, early childhood development, feelings, kids, parents, preschool, teachers on February 13, 2013 by 4cforchildren.